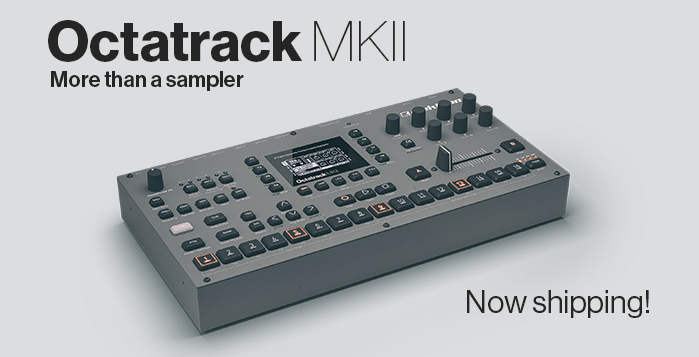 Octatrack MKII is now shipping! Does it ship with the updated firmware? Will there be a software update for Octatrack MK1 that will allow this functionality ? Not sure If I am getting you right but I think what you are trying to achieve is already possible. You have four parts per bank, which can contain different samples or even completely different machines per track. You can assign those parts to whatever pattern you like inside of a bank. If we order from the Elektron shop, will it ship same day or is it on backorder? I would love to get all those new MKIIs because of OLED, better buttons and the feature add-ons on the Rytm and Four. Too bad they do not offer a trade in, so that I send my old ones back and get a small discount on the new ones. This would make it a no brainer for me. A post was merged into an existing topic: Octatrack mk2 - The new high res encoders are amazing! If you really want the MKII, just sell your OT MK1 (instead of hoping to trade it in) and buy the MKII. When Ableton did their trade Push 1 for Push 2 deal, I got more from selling my Push 1 locally and then buying Push 2. Got a 64GB SanDisk CF ready to go. Is this your first time with an Octatrack? I borrowed a MKI for a week a year or so ago. I’ve been waiting for my OT mk2 for more than 3 months… More than enough to realize how I really need it, and that DT is not a substitute to what I use it for. It should arrive this week, and I’m tortured like a kid on the day before Christmas.